PHILADELPHIA, PA July 2010—New biomolecular archaeological evidence backed up by increasingly sophisticated scientific testing techniques are uncovering medicinal remedies discovered, tested, and sometimes lost, throughout millennia of human history—herbs, tree resins, and other organic materials dispensed by ancient fermented beverages like wine and beer. Did those ancient "remedies" work-and if so, is there something we can learn—or re-learn—from our ancestors to help sick people today? The answer is now a definitive yes, thanks to early positive results from laboratory testing conducted by researchers at Penn Medicine's Abramson Cancer Center working in collaboration with the University of Pennsylvania Museum's Biomolecular Archaeology Laboratory run by archaeochemist and ancient alcohol expert Patrick E. McGovern, PhD. Over the past two years, researchers working on a unique joint project, "Archaeological Oncology: Digging for Drug Discovery," have been testing compounds found in ancient fermented beverages from China and Egypt for their anticancer properties. Several compounds—specifically luteolin from sage and ursolic acid from thyme and other herbs attested in ancient Egyptian wine jars, ca 3150 BCE, and artemisinin and its synthetic derivative, artesunate, and isoscopolein from wormwood species (Artemisia), which laced an ancient Chinese rice wine, ca 1050 BCE—showed promising and positive test tube activity against lung and colon cancers. The next stage, testing of these compounds against lung cancer in animal models, is being planned for the future. A review of the research undertaken, and early results obtained, is available in the July 2010 issue of International Journal of Oncology ("Anticancer activity of botanical compounds in ancient fermented beverages" authored by Dr. McGovern, with M. Christofidou-Solomidou, W. Wang, F. Dukes, T. Davidson, and W.S. El-Deiry). Melpo Christofidou-Solomidou, PhD, Research Associate Professor, Pulmonary Allergy and Critical Care Division, an Abramson Cancer Center Investigator, and one of six authors of the International Journal of Oncology article, noted that the early results were especially promising: "Artesunate (AS) is an old drug that has been used in humans for malaria, but now it is being 'rediscovered' for use against lung cancer. Analysis of AS showed potent anticarcinogenic properties in lung cancer cells—a very encouraging sign. We are ready to take these findings, and this ancient/modern compound, to the next stage in testing." McGovern believes there are more medical solutions awaiting rediscovery. Using liquid chromatography-mass spectrometry-mass spectrometry (LC/MS/MS) and solid phase microextraction gas chromatography-mass spectrometry, Penn Museum's Biomolecular Archaeology Laboratory has been able to identify ancient botanical additives to earlier and earlier samples of fermented beverages, preserved as residues inside ancient vessels. "Our ancient ancestors had a huge incentive in trying to find any treatment they could to cure mysterious diseases and extend their life spans beyond the usual 20 to 30 years," noted Dr. McGovern. "Over the millennia, they may well have hit upon solutions, lost to future generations when cultures collapsed and disappeared-and now being rediscovered through biomolecular archaeology." 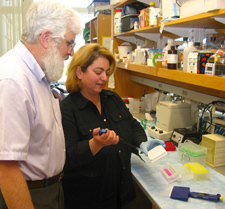 Colleagues of "Archaeological Oncology: Digging for Drug Discovery," the new project to discover anti-cancer and other medicinal benefits from ancient remedies, include McGovern, Christofidou-Solomidou, as well as Caryn Lerman, PhD, Scientific Director of the Abramson Cancer Center and Professor of Psychiatry, and Wafik S El-Deiry, MD, PhD, former Professor of Medicine, Genetics and Pharmacology at the University of Pennsylvania, now at the Hershey Medical Center and Cancer Institute. Long-time researcher at the University of Pennsylvania Museum of Archaeology and Anthropology and an Adjunct Professor of Anthropology at the University of Pennsylvania, Dr. McGovern is author or editor of numerous books on archaeology and archaeological science, including, in 2003/2006, Ancient Wine: The Search for the Origins of Viniculture (Princeton U. ), and most recently, Uncorking the Past: The Quest for Wine, Beer, and Other Alcoholic Beverages (U. of California). 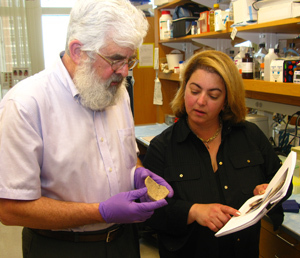 Over the past two decades he has been a pioneer in the emerging field of biomolecular archaeology. The University of Pennsylvania Museum of Archaeology and Anthropology is dedicated to the study and understanding of human history and diversity. Founded in 1887, the Museum has sent more than 400 archaeological and anthropological expeditions to all the inhabited continents of the world. The Museum is located at 3260 South Street (across from Franklin Field), Philadelphia, PA 19104, and on the web at www.penn.museum. For general information call (215) 898-4000. The Abramson Cancer Center (ACC) of the University of Pennsylvania is a national leader in cancer research, patient care, and education. The pre-eminent position of the Cancer Center is reflected in its continuous designation as a Comprehensive Cancer Center by the National Cancer Institute for more than 30 years, one of 41 such Centers in the United States. The ACC is dedicated to innovative and compassionate cancer care. The clinical program, composed of a dedicated staff of physicians, nurse practitioners, nurses, social workers, physical therapists, nutritionists and patient support specialists, currently sees over 50,000 outpatient visits, 7400 inpatient discharges, and provides over 25,000 chemotherapy treatments, and more than 66,000 radiation treatments annually. Not only is the ACC dedicated to providing state-of-the-art cancer care, the latest forms of cancer prevention, diagnosis, and treatment are available to our patients through clinical themes that developed in the relentless pursuit to eliminate the pain and suffering from cancer. In addition, the ACC is home to the 300 research scientists who work relentlessly to determine the pathogenesis of cancer. Together, the faculty is committed to improving the prevention, diagnosis and treatment of cancer. More information is available at penncancer.org. Penn Medicine is one of the world's leading academic medical centers, dedicated to the related missions of medical education, biomedical research, and excellence in patient care. Penn Medicine consists of the University of Pennsylvania School of Medicine (founded in 1765 as the nation's first medical school) and the University of Pennsylvania Health System, which together form a $3.6 billion enterprise. Penn's School of Medicine is currently ranked #2 in U.S. News & World Report's survey of research-oriented medical schools, and is consistently among the nation's top recipients of funding from the National Institutes of Health, with $367.2 million awarded in the 2008 fiscal year. Photos, top: Patrick McGovern and Melpo Christofidou-Solomidou examine a sherd from Jiahu (China), which provided evidence for the earliest alcoholic beverage in the world to date--ca. 7000 BCE. The compounds included potential medicinal additives. Middle: Patrick McGovern observes as Melpo Christofidou-Solomidou demonstrates the colorimetric assay of compounds with anti-cancer effects. The compounds were identified in ancient fermented beverages using Biomolecular Archaeological techniques. 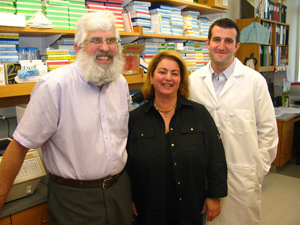 Bottom: Team of researchers involved in the Archaeological Oncology ("Digging for Drug Discovery") Project, from left to right: Patrick E. McGovern, archaeochemist and ancient alcohol expert and head of the University of Pennsylvania Museum’s Biomolecular Archaeology Laboratory; Melpo Christofidou-Solomidou, Research Associate Professor at the Pulmonary Allergy and Critical Care Division of the Department of Medicine, and an Abramson Cancer Center Investigator; and Floyd Dukes, Research Specialist, Christofidou-Solomidou Lab.